vacancies in this Baran District Collector recruitment notification are 12 posts. Applicants who are willing to apply for this Junior Technical Assistant, Accounts Assistant jobs are advised to go through the recruitment link www.baran.rajasthan.gov.in. Read the instructions, eligibility criteria before applying. Candidates eligible for this above vacancies may download the application from the given website. Application submission for the latest Baran Dist Collector recruitment vacancies will be closed on 22-12-2017. 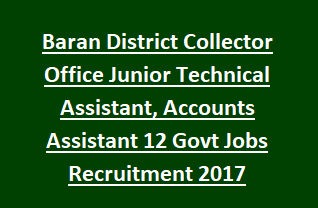 For more details of Application procedure, Age limit, Selection Process, Qualifications of District Collector and Programme Coordinator, Baran Recruitment of 12 Junior Technical Assistant, Accounts Assistant govt jobs 2017 are given below. District Collector & Programme Coordinator, Baran has released total 12 posts are given below. Total no of vacancies: 12 posts. Junior Technical Assistant: Degree or Diploma in Civil Engineering or B.E/ B. Tech in Agricultural Engineering from any recognized university/Institution. Accounts Assistant: B.Com Graduation or CA/ ICWA/ CS (Inter) from any recognized University or Institution. Full details regarding qualification info see the Baran Dist official Notification. Pay Scale for Jr. Technical Assistant post is Rs. 13,000/- per month. Pay Scale for Accounts Assistant is Rs. 8000/- per month. Candidate should have minimum age limit is 21 years and maximum age limit is 35 years. Relaxations in age applicable as per rules. Candidate will be selected for 12 Accounts Assistant, Jr. Technical Assistant posts in Baran District Collector Recruitment is based on their skills in Interview. Go through the notification for Selection procedure details. Interested/ eligible candidates must have to download the application for the Baran District Collector Recruitment vacancies using the official website www.Baran.rajasthan.gov.in. Application for the selected post must have to submit through post to the following address before 22-12-2017. District Programme Coordinator & Chief Executive DistrictCouncil, Baran.